This is a really tasty wine, relatively powerful, and rippling with layers of dark fruit. No oak and no tannins; just a big mouthful of pure supple fruit. At less than €11 for the month of February, this is a real bargain. Argentina is famous for it’s Malbec. Fragrant, rich and powerful, the wines provide a perfect match for all of these barbequed ribs, steaks and other pieces of smoky charred protein. Cheapskate that I am, I often prefer the less oaky, less extracted mid-priced versions. There is some good inexpensive Malbec around too. The Aldi Exquisite Collection Malbec is worth checking out. 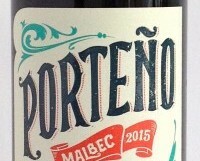 It isn’t as good as the Porteño though. This is made by Norton, one of my favourite producers in Argentina.